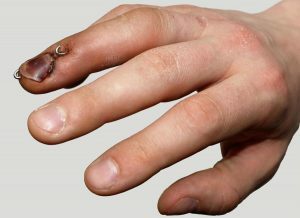 Surgery of the Hand In Mesa, Az | Gerald L. Yospur, M.D. A joint is where two or more bones come together, and muscles attach to them to allow active motion. If a bone is broken and we allow the muscles to continue acting on it, the muscles can pull the broken bone fragments apart and the bone will not heal (or will heal in a position of deformity). Carpal tunnel syndrome is essentially a pinched nerve in the wrist. 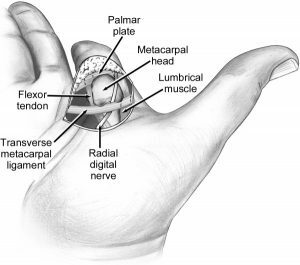 There is a space in the wrist called the carpal tunnel where the median nerve and nine tendons pass from the forearm into the hand (Figure 1). Carpal tunnel syndrome happens when pressure builds up from swelling in this tunnel and puts pressure on the nerve. A Dupuytren’s contracture is the name for a thickening of the fascia in the palm of the hand, which leads to a flexed posture of the main knuckle of the hand (MCP joint) and first joint of the fingers (PIP joint). It most often affects the ring finger and small finger. 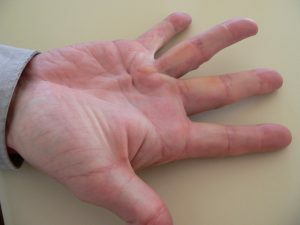 The palmar thickening is very subtle when it starts, but typically worsens over a period of several years, to the point where the fingers are “stuck” down in a flexed position. Dupuytren’s contractures are not inherently painful, however they can be bothersome in daily life and/or aesthetically undesirable. This is a specific type of tendinitis that occurs at the level of the wrist on the thumb side. You might see swelling in this area and it can be tender to touch. 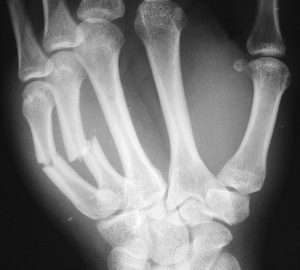 Twisting and grasping motions of the hand can be quite painful as a result. Treatment includes anti-inflammatory medication, hand therapy, splinting, corticosteroid injection, and surgery for those that do not gain sustained relief from the above. Sometimes referred to as a “jammed finger,” a mallet deformity typically occurs when the end of one’s finger makes forcible contact with an object (basketball, wall, someone’s body, etc). When this happens, the end of the extensor tendon at the backside-tip of the finger (near the fingernail) is ruptured, causing the finger tip to flex forward slightly. It can be passively straightened, but you will not be able to actively extend your fingertip. Tendons of the forearms and hands facilitate active wrist and finger forward movement (flexion) and help extend (or straighten) the wrist and finger joints. 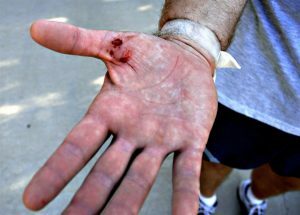 Tendons are often injured through cuts or trauma, sports-related injuries, crush injuries, animal bites, car accidents, shattered glass, etc. A joint is where two bones connect. Either through genetics or an injury the joint can wear out. The cartilage that was protecting the joint surface can be lost causing rubbing of bone on bone. While it is not always the case this can be quite painful and limit activities with the use of the hand. Ganglion cysts are benign cysts that arise from inside the wrist joint. They typically appear on the top of the wrist but can also occur on the palm side of the wrist as well. 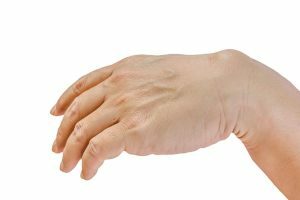 They are not inherently harmful, but the presence of a ganglion cyst can make wrist movement uncomfortable and can lead to stiffness and hand weakness. Treatment typically entails surgical removal. 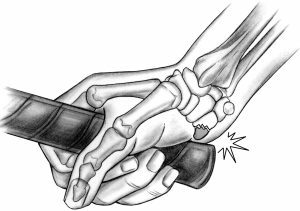 Like many articulating joints, the thumb joints are each stabilized by a “capsule” of supportive soft tissue and ligaments. This prevents the joints from moving outside of normal flexion and extension. A sprain is a type of injury that involves ligament damage. Often this is a stretched ligament, but it can also be more severe. The ligament can be torn or completely pulled out of the bone it is normally attached to. The wrist is made up of 8 small, marble-sized bones, or “carpals,” that form the wrist. These bones are right in between your long forearm bones and your hand metacarpal bones. The hamate is one of these 8 wrist bones. It has a small projection coming off of it called the “hook of the hamate,” which is most often fractured by people that play baseball, golf, and racquet sports. A carpometacarpal boss is a bony lump or bump that occurs over the back of the wrist. It presents similarly to a ganglion cyst. It is not inherently dangerous. It can be painless, or it can be uncomfortable and restrict wrist motion. Treatment course depends on the individual situation, presentation, and potential functional limitations that may exist. Nailbed injuries are injuries to the fingernail, and the soft tissue below and around the fingernail. They can occur for a variety of reasons including trauma (sports injuries, door slams), cancer, infection, work-related injuries, or cysts/warts. Depending on the location, animal bites can create damage or rupture to tendons and ligaments, and occasionally result in fractures. Young children and older adults, or those with multiple medical problems and/or brittle bones, are most susceptible to fractures. The digital nerves allow us to sense temperature, vibrations, texture, moisture, and other things about our environment. They can be damaged through any type of trauma ranging from small cuts to motor vehicle accidents. Fingertip injuries can be caused by many things. They can be crushed, closed in a door, or hit by a hammer. A heavy object can be dropped onto the finger. They can also be cut by a kitchen knife, power tool or another sharp object. 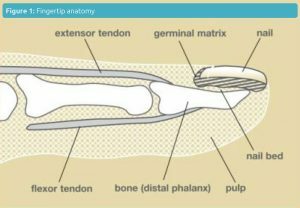 A fingertip injury can result in damage to the skin, bone, nailbed, tendons and the pulp, the padded area of the fingertip (see Figure 1). You can also damage the nerve endings in the fingertips. This is a condition whereby in it’s mildest case you may experience pain in the palm of the hand at the base of a finger or thumb. This may progress to where you feel a clicking or popping (triggering) of the digit. Some people feel like a joint is dislocating. This is not the case however. It is the result of thickened tissue in the palm that does not allow for smooth gliding of the tendons that control motion of the finger. In more severe cases the finger may get locked in the palm and you have to use your other fingers to unlock it.